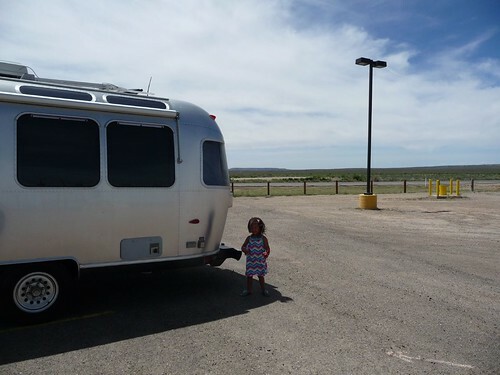 Mali Mish – Day 110: Aztec Ruins and Durango, Colorado. 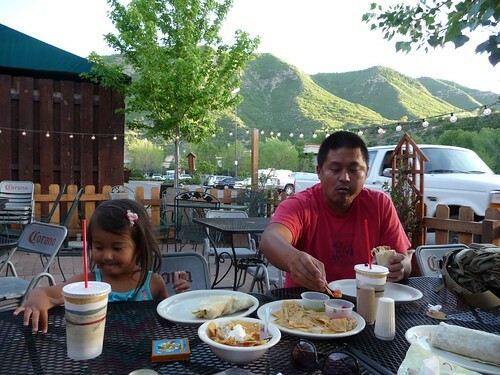 Day 110: Aztec Ruins and Durango, Colorado. After 2 nights in Albuquerque we decided that it is time for us to move on. We are so close to being home that a little bit of post trip depression is creeping up on us. Driving a few hundred miles a day is now our daily routine so any place we go from here is basically a weekend trip for us once we get home. 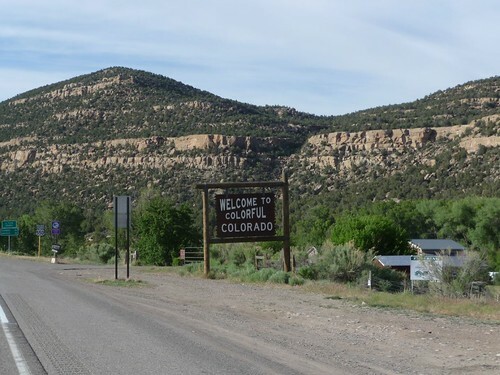 The obvious thing for us to do is stay on I-40 and drive towards Flagstaff, Arizona but we decided to squeeze in another state, or maybe 2, before it is all over. We got the girls cinched in and down the highway we went. Back in Charleston, South Carolina we met a nice couple who had a Siberian husky named Blaze. We got to talking about places we’ve been and places we need to go. 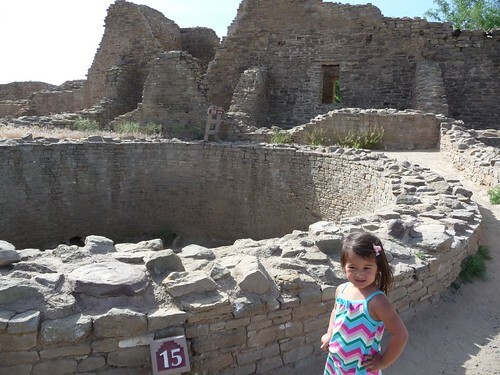 I had been studying our possible return trip and thought that northeastern Arizona and Southwestern Colorado had some cool Puebloan preserves worth seeing. They told us that they had just returned from Cortez, CO. where their son lives and we should definitely go if the opportunity is there. I figured that this is as good of an opportunity as any so off to Colorado we went. We headed north from Albuquerque and there is a whole lot of nothing for miles and miles. At least it’s not the kind of nothing like we went through in Arkansas and Texas. Here we got to see lot of mountains and even some snow on the peaks in the distance. The girls by now are getting quite creative in keeping themselves entertained on these drives. 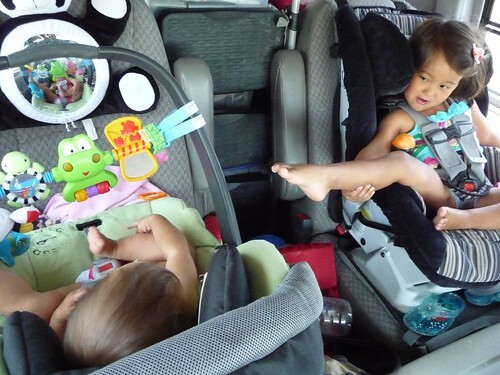 Aside from watching movies and taking naps, they can also play with their feet to keep things interesting. 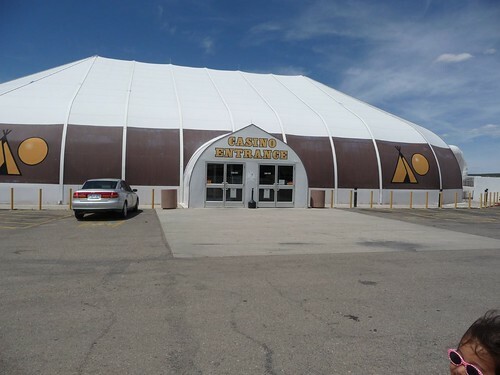 When it is time for us to take a little break, the only thing we could find was this Indian Casino under a giant tent. Do you think we can sneak them into the casino? 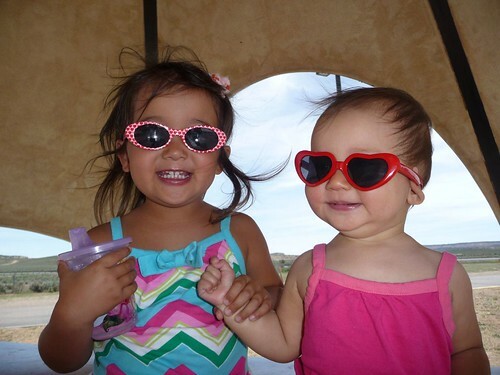 They will never know they are actually kids under those sweet shades! Wish us luck. Let’s go play some slot machines!!! Well, I guess our plan was not quite as fool proof as we thought. The security guards saw right through their disguise and we had to retreat back to the parking lot. It is probably well over 90 degrees today so it’s better that we cut this break short and head back down the road. 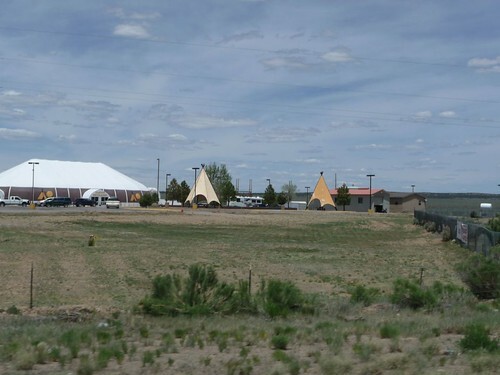 As we kept heading north on highway 550, we got to a little town called Aztec, New Mexico. It was a perfect place for us to take another break and just so happens that there is a National Monument here that we get to check out for free with out National Parks Pass. 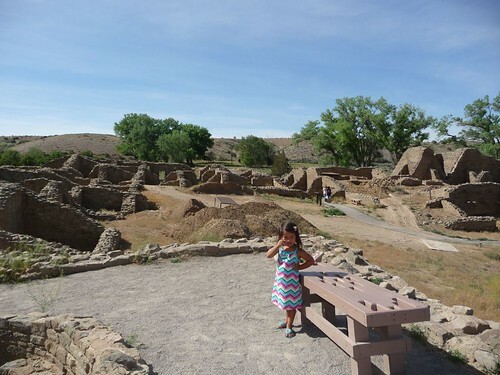 It is a neat little stop called Aztec Ruins National Monument. Although the name is called Aztec Ruins, it actually has nothing to do with the Aztec at all. 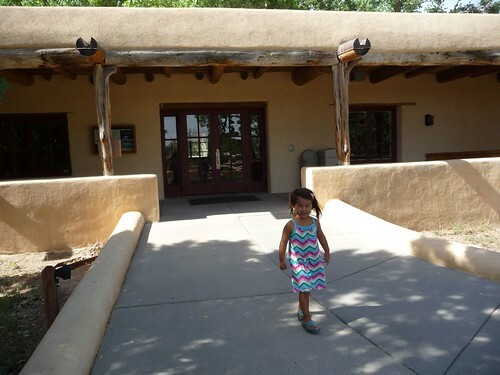 It is in fact a settlement by the ancestral Puebloans, also known as the Anasazi. These buildings date back to between the 11th and 13th century and were discovered in the early 20th century. In all there are about 500 rooms with many of them joined by passageways no taller than 5 feet. 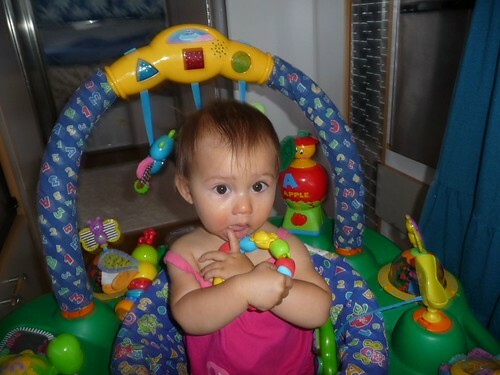 Ava thought they were awesome because the doorways were ‘just her size’. These ruins were once completely buried under the earth and were uncovered basically one bucket of dirt at a time. 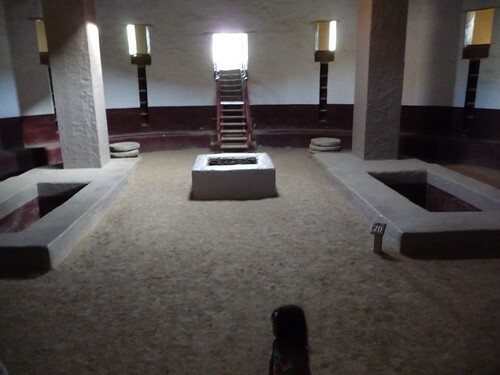 This large circular room is what is called the Kiva room. It is believe that many religious and civil gatherings would have taken place in there. 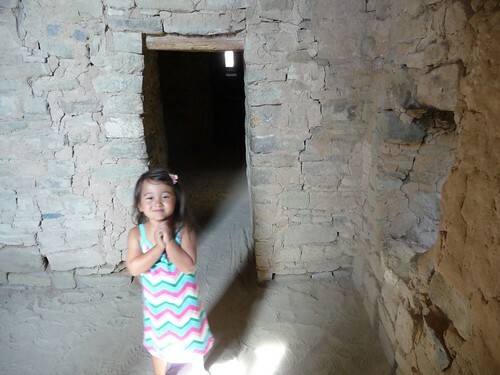 Here is a reconstructed Kiva room to show what they might once have looked liked. Straight out of an Indiana Jones movie. Let’s get out of here before a giant ball of rock starts rolling towards us. As we continued to head north, we finally got to the state of Colorado. Even though we are not going to be doing much exploring in this state, I can officially say that we made it to Colorado. 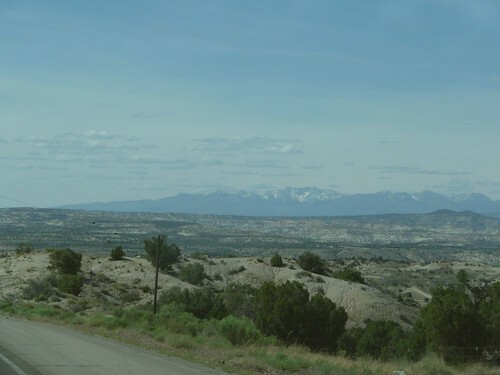 There is a huge difference between the climate and scenery between New Mexico and Colorado. 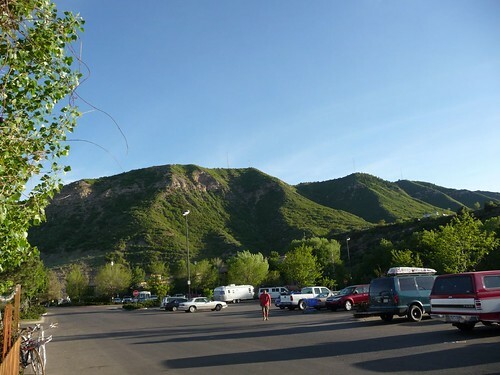 The city of Durango on the edge of the San Juan National Forest is lush and green as opposed to the dusty desert in the lower elevations of New Mexico. We had scoped out a Wal-Mart to spend a night at before heading out for some sightseeing tomorrow but once again we struck out with a ‘no over night parking’ sign in the parking lot. Tired of being shafted by Wally World, we stopped to do some research while getting a bite to eat at a little burrito joint called Cocina Linda. We had high hopes for this place because it had everything going for it. Nice outdoor seating, fresh ingredients, friendly looking staff and some kind of award hanging on the wall. Upon closer inspection of the award, we realized why the food was just a little disappointing. 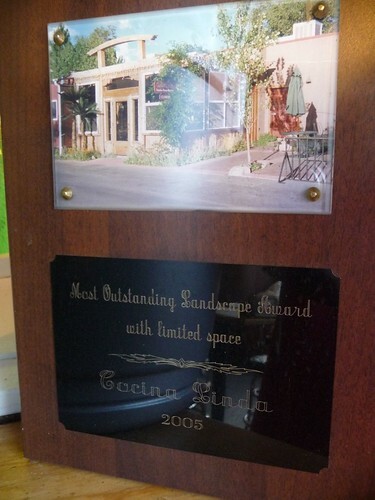 Apparently Cocina Linda is not known for their food but rather known for having the ‘Most Outstanding Landscape with Limited Space’. Day 111: Mesa Verde National Park. 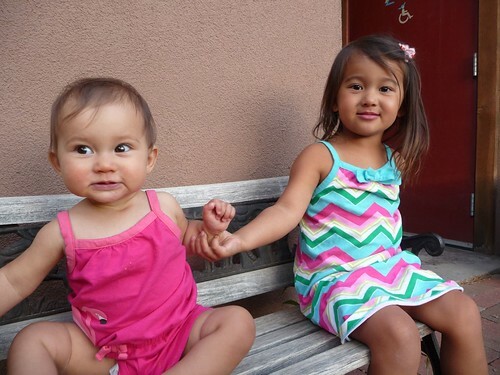 One Response to Day 110: Aztec Ruins and Durango, Colorado. What a beautiful adventure! Your pictures are amazing! Thanks for sharing with us!